Taiwan’s Navy Test Flies Albatross in Pingtung » UAV DACH e.V. 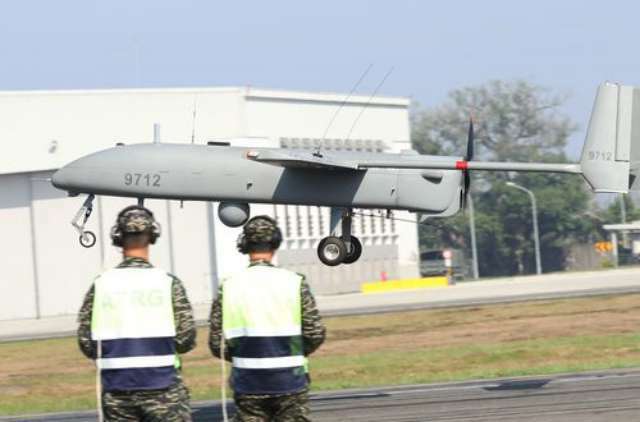 Taiwan’s Navy held its first ever fly-over demonstration using the locally manufactured Albatross unmanned aerial vehicle (UAV) in the southernmost county of Pingtung Thursday, testing the remote controlled UAV’s reconnaissance and surveillance capabilities as part of a joint military operation. The drone, developed by National Chung-Shan Institute of Science and Technology (NCSIST), gave its first public takeoff, landing and fly-over demonstration at a military base in Pingtung. After several reported crashes involving Albatross UAVs over the past few years, including one when a drone crashed into the sea during a military exercise off Taitung on Jan. 24 due to suspected mechanic failure, Navy officer Hsieh Min-chang (謝閔璋) said the Navy will continue to gather data and information about drone operations so NCSIST can modify and improve the model. Access to accurate and timely intelligence is essential to effective command and control in a battle situation, the Navy said, adding that using the Albatross drone in conjunction with aircraft and warships is expected to significantly improve national defense and air reconnaissance capabilities. Albatross drones are used for daytime and nighttime surveillance and reconnaissance, target acquisition and designation, battlefield damage assessment etc. In addition, all real time imagery and data can be transmitted to ground control stations to assist with the rapid flow of information to the C4ISR (command, control, communications, computers, intelligence, surveillance and reconnaissance) systems, which plays a key role in combined operations, according to the NCSIST. The Albatross weighs 55 kilograms, has an 8.6-meter wingspan, a maximum flight time of 12 hours and a flight range of 180-km, according to the Navy. UAV DACH: Beitrag im Original auf https://www.uasvision.com/2019/02/04/taiwans-navy-test-flies-albatross-in-pingtung/, mit freundlicher Genehmigung von UAS Vision automatisch importiert. Der Beitrag gibt nicht unbedingt die Meinung oder Position des UAV DACH e.V. wieder. Das Original ist in englischer Sprache.